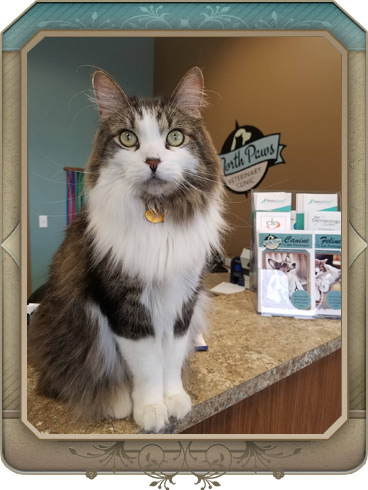 Your pet deserves the best, and that's why the entire veterinary team at North Paws Veterinary Clinic is committed to making you and your treasured companion central to all we do. We practice veterinary medicine because of our dedication to helping pets live long, happy and healthy lives; we're pet owners ourselves, and we know your pet is a very important member of your family and deserves high-quality care from experienced, compassionate professionals. 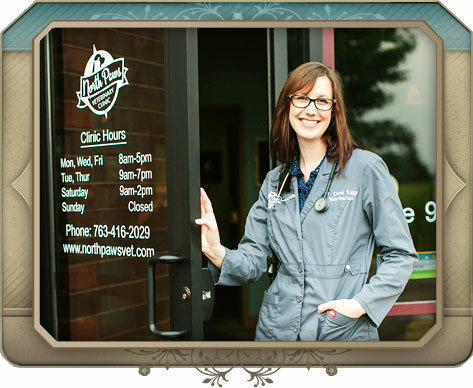 Dr. Coral Riggs, veterinarian and founder, opened North Paws Veterinary Clinic in 2014 to provide pets and pet owners in the Maple Grove area state-of-the-art diagnostic technology and a caring, skilled team. Your pet's lifetime wellness begins with North Paws Veterinary Clinic's pet wellness care. This includes a comprehensive nose-to-tail examination, vaccinations and preventative treatments. We also offer preventative care packages for your pet. These packages include all vaccinations for one year, parasite prevention, disease and parasite diagnostic testing, free office visits for package services, a free pet ID card, optional dental care, and 10% off additional office visits, services, and pet care products. For more information about our preventative care packages, please contact North Paws Veterinary Clinic today! Taking your cat to the veterinarian can be stressful for you and your pet. At North Paws Veterinary Clinic we've taken steps to make our practice the most cat-friendly in the area. Because a noisy, unfamiliar environment can be stressful for cats, our veterinary clinic in Maple Grove maintains a separate cat ward with cat condos for your pet's comfort and play. We also have a quiet waiting room and exam area. If your pet becomes sick or injured, we're here to provide the compassionate, skilled veterinary care your pet needs and you want. Our pet diagnostic and surgical capabilities and in-house laboratory mean we can work quickly to get you an accurate diagnosis and treatment recommendation and minimize your pet's discomfort and your worry. When you bring your pet in to see us, we want you to feel confident your pet is receiving the best care possible. Ask us anything you want to know. Dr. Riggs knows great veterinary care begins with taking the time to get to know your pet and talking with you. Our commitment to you and your pet doesn't end when you leave our hospital, which is why we also make sure you have the knowledge you need to provide the best possible care for your pet at home. Please read through our website. We've included a variety of materials regarding the services we provide and about why you should trust us with your pet's health now and for years to come. If you have any questions or would like to schedule an appointment, please do not hesitate to contact us. We look forward to meeting you and your cherished companion. We accept cash, Visa, Mastercard, Discover, American Express, Citi Health Card, and CareCredit. Payment is due upon completion of services. Please note: a 50% deposit is due when dropping off a pet for services totaling $500 or more.